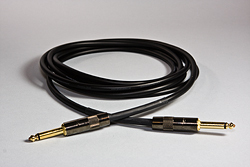 The Canare 4E6S is excellent cable for guitar players because it attenuates the high just enough to warm up the signal without costing you sound quality. Plenty of low end and mids. Great cable, durable jacket, braided sheild and professionally assembled. You can specify if you want two straight 1/4's or two 90's when ordering or select the newly available Quiet Plug from G&H (only available in gold with black back). One quiet connector at your guitar end is all you will need. Great for swapping guitars with your amp turned on! Available in 5 colors, black, red, orange, purple and blue. Please choose cable color and length.